Located in the desert of southeast California, only a couple of hours east of LA and a long 8 hours drive from San Francisco, Joshua Tree is one of the less known national parks. I guess the reason this place is not as famous as let's say Yosemite or Death Valley it's because its natural features are not as striking as those of other parks. But, I believe, this rather large park that encompasses parts of the Colorado and Mojave deserts is well worth a visit. As you probably already guessed, the park is named for the Joshua tree that you'll find in abundance throughout the park. This unusual looking tree was named by Mormon pioneers after the prophet Joshua because the branches of the tree reminded them of the prophet waving his arms to the people, toward the promised land. These trees are native only to this part of California. But the Joshua trees are only one component of this park. In fact, the southern portion of the park which is Colorado desert doesn't feature the Joshua trees but instead, the landscape is dominated by creosote and different types of cacti. The northern part, which represents the Mojave desert is cooler and has more moisture and a lot of Joshua Tree. For many people the biggest draw to Joshua Tree is the rock climbing. I've read somewhere that this is one of the best places for rock climbing in the world with 5000 rock climbing routes to choose from. This appeared to be true. When we visited we could witness many people making their way to the top, trying to conquer the big boulders. Many of the sights that the park has to offer can be viewed from your car, since there are roads going both to the Mojave sector and to the western end of the Colorado sector. But I do believe that hiking and climbing are the best ways to explore this area. This is a park where one is meant to get in touch with nature and experience the life of the desert. It will be hard to notice the plants and the animals from the car. Trails are abundant and well-marked. Most of the activities are in the northwest corner, close to the towns of Joshua Tree, Twentynine Palms, and Yucca Valley. These three small towns have plenty of motels, restaurants, and stores. 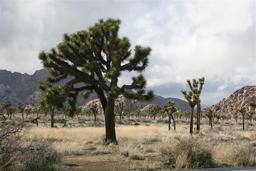 Joshua Tree may not be for everyone, but is perfect for those with a love for the nature and a paradise for climbers.